Enhance your visibility and philanthropic reputation by partnering with Jewish Federation of Greater Kansas City. For more than 80 years, Jewish Federation has worked to build relationships, build community and enhance the quality of Jewish life in the greater Kansas City area. Being a corporate sponsor of Jewish Federation links your good corporate name with an organization that has a proven track record and reputation in our community—one of giving and giving back. 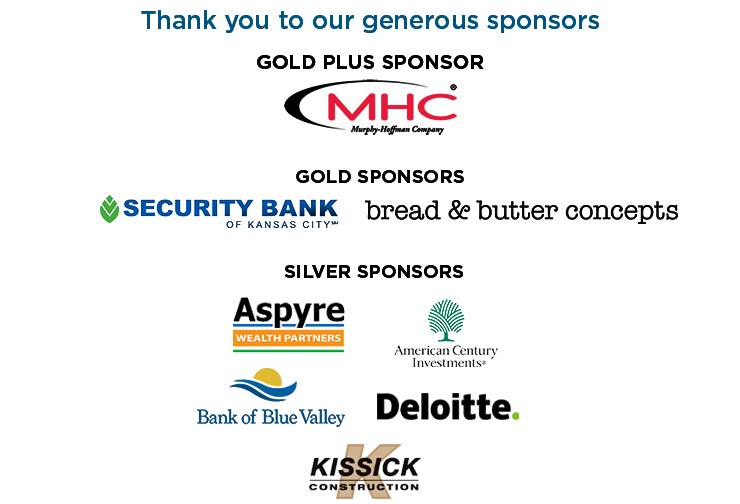 Join MHC, Bread & Butter Concepts, Security Bank of Kansas City, Bank of Blue Valley, Aspyre Wealth Partners, Deloitte, Kissick Construction, and other prominent businesses partnering with Jewish Federation. Sponsorship of an event or series of events provides the opportunity to expand your access and visibility to—and enhance your reputation among—the entire Jewish community or a key segment of the market. Get in front of prospective new clients or team members and make a meaningful impact today! Contact Derek Gale, 913.327.8123, for more information.